My Top Favorite Gorgeous Artistic Bedding Sets for Sale! My Top Favorite Unique and Very Colorful Artistic Bedding Sets for Sale! If you know my work already, you probably know that I am absolutely CRAZY about cute, colorful and very UNIQUE bedding sets! 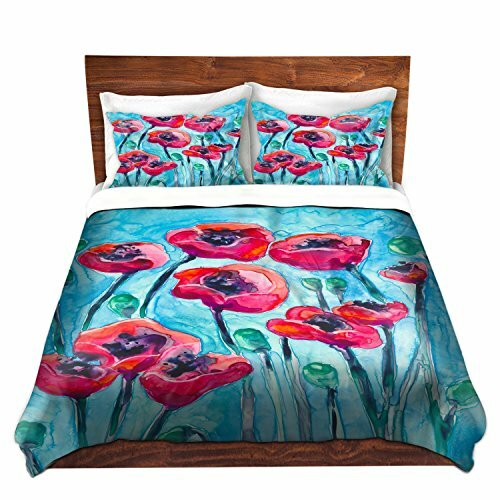 I found the most amazing, surreal, magical and gorgeous brushed twill artistic bedding sets for sale online! 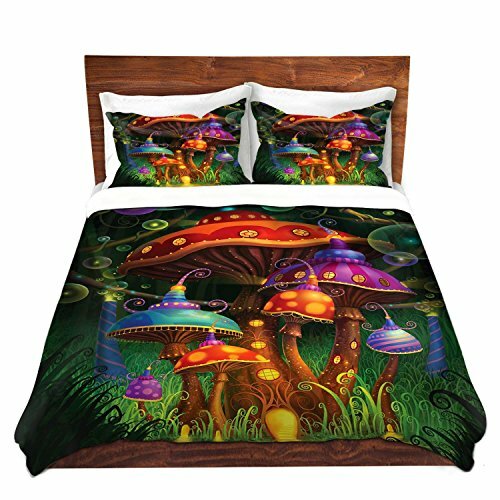 Yes, just like this stunning enchanted evening, colorful mushrooms design on a magical forest bedding set for sale in the picture above! Here are more of these! I hope you find the perfect one for your bedroom! 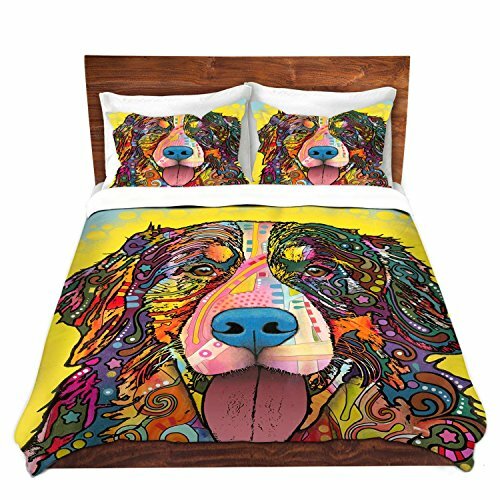 Artistic Mountain Dog Design Colorful Duvet Cover Set! Have you ever seen a gorgeous artistic dog design bedding set like this before? My jaw is still on the floor! How cool and amazing is it? You can choose this duvet cover in three different sizes and with the matching pillow shams as well! Artistic Cat Design Unique Brushed Twill Bedding Set! 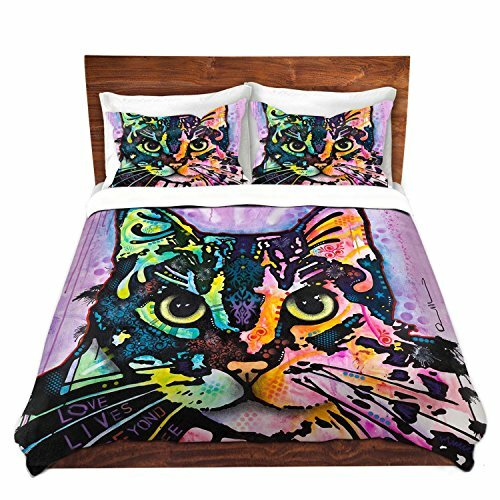 It is a stunning cat design artistic bedding set for sale! Are you also in awe? How amazing is your bedroom going to look with these? Just insert any old comforter or blanket inside the duvet cover for a fluffy look and feel! Another amazing artistic bedding set by DiaNoche Designs! This one is called ‘Poppy Sky’! Full of beautiful poppy flowers on a blue sky background! *Adorable Joyful Artistic Duvet Cover Set! 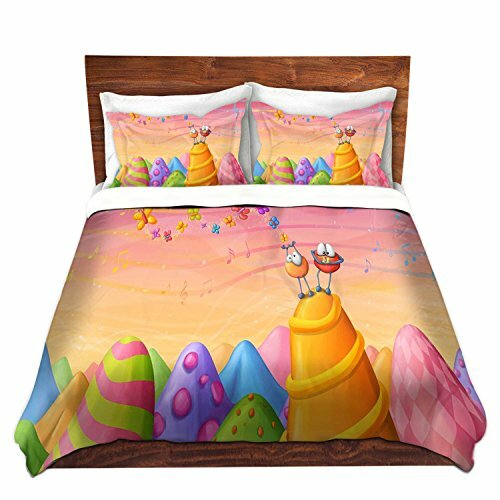 If you are looking for the most fun and colorful artistic duvet cover set for your child’s bedroom I think you are going to LOVE this one! 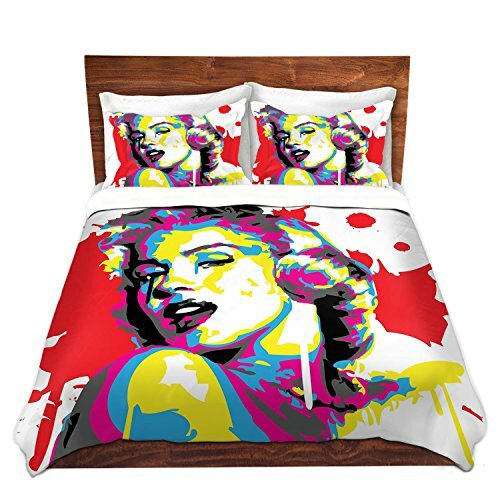 Stunning Marilyn Monroe Artistic Bedding! We can see Marilyn’s gorgeous face in amazing colors splashed all over! Will definitely make everyone gasp in awe when they see it! 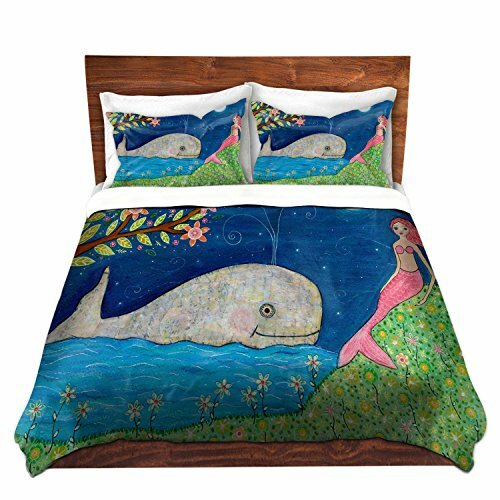 Another favorite artistic bedding set for sale in my opinion is this gorgeous and very unique mermaid and whale duvet cover set! A gorgeous pink mermaid is interacting with a beautiful whale at night! 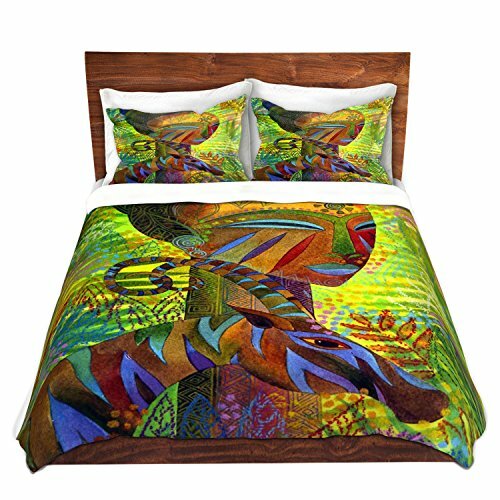 Artistic African Queen Design Colorful Bedding Set! If you want to find a cool, fun and beyond unique artistic bedding set for your bedroom, check out this stunning ‘African Queen’ design duvet cover set by DiaNoche Designs! It is available in three sizes, with or without the sham set. 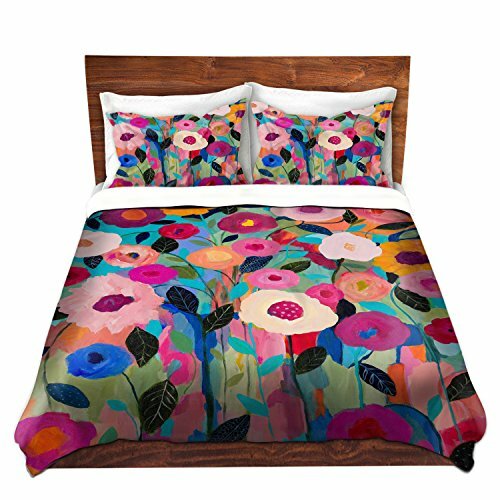 I had to show this beautiful artistic flowers design colorful duvet cover set too! It’s beyond gorgeous, isn’t it? *Very Unique Rooster Design Artistic Bedding! Talk about getting up early with the roosters! 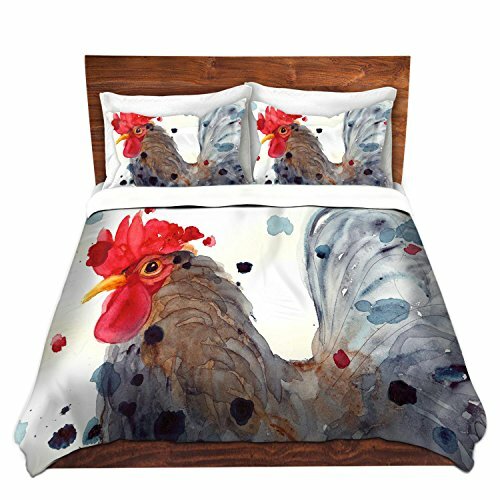 Have you ever seen a rooster design bedding set before? Happy Holidays Fun Artistic Bedding Set! I think it’s a mom and her little girl! What a perfect bedding set for a mom or a daughter! I love it and it’s making me tear up already! One Fun Spring Day Happy Artistic Bedding Set! 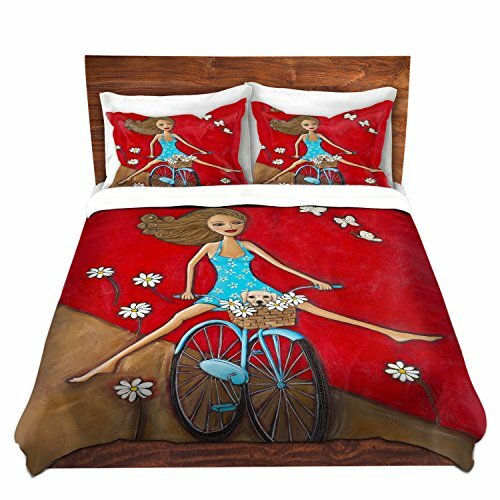 How fun and GORGEOUS is this ‘happy bedding set’ of a woman riding her bicycle with her puppy surrounded by flowers? She is also wearing a gorgeous spring floral dress! I am so in love with this duvet cover set! Another stunning artistic bedding set from DiaNoche Designs! Three ladies are enjoying drinks on a bistro! It seems they are getting ready for a fun night in the town! Great bedding set for a woman’s bedroom! *I hope you enjoyed my selections of artistic bedding sets from this page and were able to pick one for your bedroom! Cool 3D Duvet Cover Sets! African queen.. how can I order? Hi there! Thanks for visiting! Just click on the image. Thank you!